The European Union is a political and economic union of 28 countries. Originally formed in 1958 by six countries (then the EEC), the EU has expanded in terms of size and integration. The aim of the EU is to promote European harmony through creating a single market, enabling the free movement of goods, services and people. European harmony - European Union countries are no longer at loggerheads like they were in the past. With the exception of civil war in Yugoslavia (which wasn't in the EU at the time), Europe has managed to heal the divisions which were so painfully exposed in the two World Wars in the Twentieth Century. The EU was awarded the Nobel Peace Prize in 2012 for helping to promote peace and international co-operation. Many Eastern European countries are keen to join the EU because they feel it will help promote economic and political stability. Legal and human rights. The EU has a strong commitment to human rights, preventing discrimination and the due process of law. This makes the EU attractive to countries, such as the Ukraine who wish to share in similar legal and human rights. Prospect of membership has helped modernise countries, such as Turkey. The Copenhagen Criteria for EU membership enshrine a commitment to human rights, the rule of law and a market economy. The prospect of gaining membership of the EU, encourage countries to implement human rights legislation. EU is one of strongest economic areas in the world. With 500 million people, it has 7.3% of the world's population but accounts for 23% of nominal global GDP. Free trade and removal of non-tariff barriers have helped reduce costs and prices for consumers. Increased trade with the EU creates jobs and higher income. Over 52% of UK exports are to the EU. Trade within the EU has increased 30% since 1992. According to one study - over ten years (1993-2003), the Single Market has boosted the EU’s GDP by €877 billion [£588 billion]. This represents €5,700 [£3,819] of extra income per household. EU structural funds to help Eastern European economies develop will benefit the UK in the long term because as they become more affluent, they will be able to buy more UK exports. The European Union has attracted greater inward investment from outside the EU. Inward investment grew from €23 billion [£15.4 billion] in 1992 to €159 billion [ £106.5 billion] in 2005. The UK is the 5th largest source of inward investment in the world, and being a member of the single market is an important factor in encouraging Japanese firms. 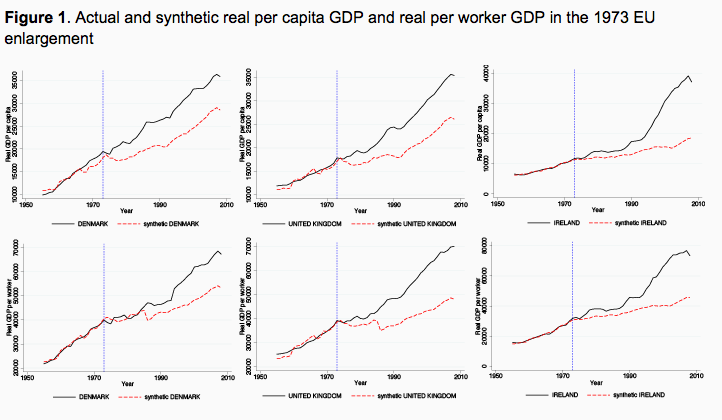 Free movement of labour and capital have helped create a more flexible economy. For example, UK and Ireland have benefited from the immigration of Eastern European workers to fill labour market shortages in certain areas, such as plumbing, nursing and cleaning. EU migrants are net contributors to UK Treasury. EU migrants tend to be young. Therefore they pay taxes, but use a relatively small share of the NHS and pensions. See: Fiscal effects of immigration. Net migration has helped deal with the UK's demographic timebomb. EU has enabled people to travel freely across national boundaries making trade and tourism easier and cheaper. According to the European Commission, more than 15 million EU citizens have moved to other EU countries to work or to enjoy their retirement. Easier to use qualifications in different member countries. This makes it easier to work abroad without having to retrain in different national qualifications. Mutual recognition of safety standards and rules have helped reduce costs for firms. This has encouraged the development of small and medium business who rely on the low cost of exports. Social charter enshrines protection for workers such as a maximum working week, right to collective bargaining and fair pay for employment. European Arrest Warrant (EAW) scheme has made it easier to track criminals across the European continent. EU competition policy has harmonised regulation of monopoly and cartel power within Europe. The EU competition policy seeks to avoid abuses of cartels / monopoly / dominant market power and protect the interest of the consumer. There has been successful deregulation of airlines, electricity and gas markets. Consumers are free to shop in any EU countries without paying any tariffs or excise duties when they return home. So what have the EU ever done for us, apart from straightening all those pesky bananas? The Independent list of benefits of EU is a joke and cannot be taken seriously. The so-called benefits are out of date e.g. economic benefits to Spain, Ireland, Portugal. The EU member countries are not at war more because of NATO and nuclear weapons than being in the EU. The benefits do not apply to the UK but to other countries. 60% of UK trade is in the EU and the UK is in negative trade balance with the EU on that trade i.e. no benefit. the idea that a trade deficit = no benefit is mercantilism, discredited since Ricardo at least... your economics is what needs updating, not the Independent's list. - in other words most UK citizens. 51. marxists finally get to live their dream without a fight. The economic benefits that you quote also have problems. Most particularly the use of the term "European Union" for the pre-Maastricht (pre-1993) period. The European Union is a strong movement towards political union and differs from the EEC. To support the EU you would need to show a discontinuity in economic data after 1993. On the other topics in your article, you are often describing areas where the EU has sovereignty. The EU would only be a benefit if you could show that the changes you describe, such as raising the quality of water on beaches, would not have occurred had the UK been sovereign in these areas. I would strongly recommend you, and your readers to take a look at: The Imbalance of UK-EU Trade. Ultimately the issue of membership of the EU depends on sovereignty. At the moment many people prefer the way the EU passes regulations to the way the UK might pass laws. However, if the UK disappears in a full political union and the EU were to swing to the Right and started repatriating Muslim migrants these same people might be screaming for a Brexit. But it would be too late and Brexit would probably no longer be an option. The OECD is responsible for the lower mobile phone tariffs. The EU is not responsible for the clean waters act. This act was drawn up multilateral by a whole host of world countries. Regarding trade the EU is not very good at FTA,s Switzerland has more FTA,s than the EU. Not has kept the peace not the EU. the eu also has many problems which should be listed next to the loopholes in the benefits so people can recognise the loopholes and decide for themselves s whenever they think the reason is good or bad. You are all gonna lose this. The young generation will hate you for it. The Remain vote looks like it was made by the mobile section of the population - the upper classes, hangers on, students and young single adults. The Leave vote was made by those in immobile careers and those with local responsibilities and friends. It was Floateurs versus Settlers. If a member of the mobile population actually realises their dream they depend upon the Settlers to provide decent countries where they can return after making the big bucks elsewhere in the world. Somewhere someone must care for localities and be attached to Place and these people should not be beholden to governments run by Floateurs. The EU imports billions of pounds worth of goods and services from non EU countries. Why should the UK be any different to all the other non EU countries who sell to EU? The UK managed to make its own laws before it joined the EU and can do so again. Why do we believe it is necessary for others to make our laws and what evidence is there that Human rights, workers rights , environmental needs will all be forgotten without help from Brussels. UK is part of Europe and will always be so co operation where it adds value to the UK will always be a priority for any UK Government. As a younger person I'm at a loss to see why I should hate anyone for voting to leave the EU.